romathio | education. faith. family. Two years ago I had both my Honors Algebra 2 and my Honors PreCalc classes complete a Desmos Art Project. The students used the various functions, inequalities, and equations they learned to recreate a picture. They had to use transformations and domain and range. I was excited to have students do this project because they could combine math with art & tech, plus each project would be unique. My biggest struggle was creating a rubric to grade the projects. I looked at several online, but never found anything I really liked. In desperation, because I needed SOMETHING, I created an absolutely horrible one that was based on the number of functions/equations they submitted; basically it was about compliance & behavior, not about learning. I knew the rubric was bad, but it was one of the moments where something is better than nothing. Here are the directions I gave the students. Here is the rubric. It’s awful, right? Here’s pics in case you didn’t want to look. You might wanna shield your eyes, it’s really bad. I’ve long used Standards Based Grading and worked towards grades focusing on what students know, not behavior. But that project grade was definitely more about behavior. Ugh. This year, when I repeated the project, I was determined to have a better rubric. With the craziness of being a teacher and my perfectionism that results in procrastination, I almost ended up with the same one! Originally, I did this project at the end of the year. The main feedback I received from students was it was the best way for them to learn domain and range. Based on that, this year I am doing the project early in Algebra 2. Therefore, my Algebra 2 students have recently started the project. I found Nat Banting‘s directions that he gave his students for a Desmos Art Project and lifted some of his language to add to my directions. You can find my updated directions here. The biggest change is in my rubric. I moved to what is called a single-point rubric. The idea is basically you have a middle column that is the criteria for your students. The left side is blank for areas of improvement and the right side is blank for where the student excelled. This was my first attempt at this type of rubric and I’m liking it so far. I’m sure it could be better and would love feedback for how to make it better. I have 2 more Algebra 2 courses this year that haven’t started yet, so I can actually adjust this year for future classes! I debated a lot about the Project Management row. It is still behavior oriented. Yet, when we look at the skills and dispositions our students need outside of school, project management is a skill that they need. I decided to make it a part of the grade, but a minor part. I may regret it later. From there, I focused on the key knowledge and understandings that I wanted students to gain from this project. (Note: our school has heterogeneous classes where students can opt in for Honors distinction, that’s why you see one line about Honors.) Instead of requiring a certain number of each type of function, I tried to focus on students showing their learning of each function, transformations, and domain and range. I moved most of the behavior related part of the grade to Project Requirements. I decided that these aren’t being graded themselves. Either their project meets the basic requirements or it doesn’t. If it doesn’t, I’m not grading it; I will put a zero in the grade book as a placeholder and the student needs to get the project up to meeting the basic requirements. As I explained to my students, if my boss gives me a project, it’s not acceptable for me to do it half way. I either meet the basics of the project or I don’t. If I don’t, that can impact my employment. Once the student has the requirements met, I will grade their project. The consequence for not completing an assignment, or for it being incomplete, is to complete the assignment so the student can learn. Lastly, I require my students to self-assess on all work like this. I had a grad school prof require this, which annoyed me at first. However, I saw how helpful it was to my learning. Students will submit the link to their Desmos project on a copy of the rubric where they have self-assessed. They are to “think like a lawyer” and prove their case as to why they should be assessed on the rubric the way they are describing. One of our art teachers will be helping the students with printing and mounting their art work. It will be displayed for an Exhibition Night at our school! If you have other ideas for a project like this or how to make my rubric better, please let me know! Have you used a single-point rubric before? This entry was posted in Assessment, MTBOS, SBG, Teaching and tagged Alg2, Algebra 2, Competency Based Education, Grading, Mastery Based Grading, math, Rubric, Single Point Rubric on September 11, 2018 by romathio. Why are we all so tired at the end of day 1? Is it the adrenaline rush? I’m wiped but it was a fabulous day. I love having the energy of students back in the building. 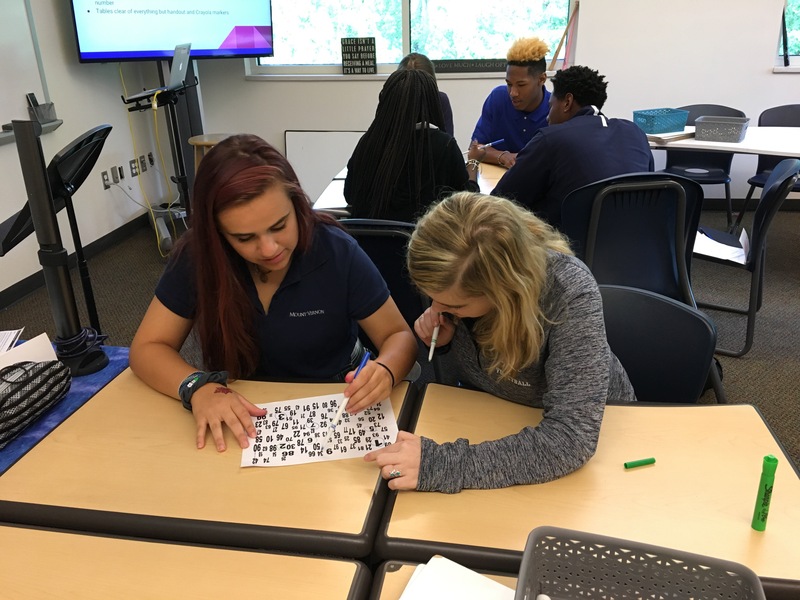 For my Algebra 2 classes, I used Sara Vanderwerf’s 100 game task for teaching great team work. It went FABULOUSLY! 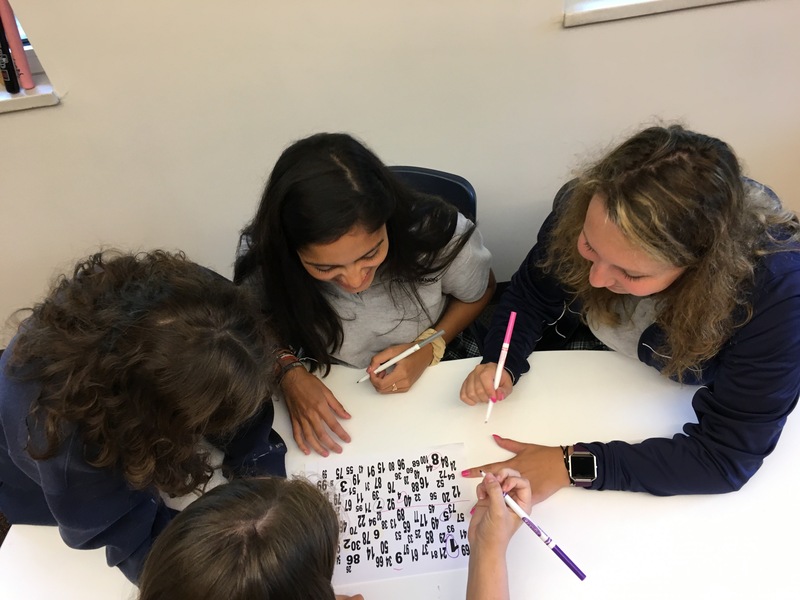 This entry was posted in MTBOS, Teaching and tagged Alg2, Algebra 2 on August 15, 2017 by romathio. This is the 4th in a series of posts I’m writing on the reading part of summer+ learning for my job. If we are to prepare students for a vastly different future, the first task is to identify what we believe to be the critical dispositions of deeper learners and then suggest ways to design instructional and assessment strategies intended to cultivate the growth of deeper learners over time. Deeper learning …will necessitate transforming the educational process from a content-oriented, subject-centered, test-driven frame to a view of education being dispositional in nature. Response: This makes me a bit nervous. Definitely need to read more to understand what they mean. There are a variety of views on what those dispositions should be. In general, problem solving, collaboration, critical thinking, and effective communication. Response: These are also 4 of the MV Mindsets. The other 2 are creative thinking & ethical decision making. Creative thinking was in one of the lists in the book. What concerns me is only one of the models in the book mentioned ethics. The others mean nothing if the person employing them is unethical. I can see how this chapter would be a good all-school read since we will be assessing mindsets in all grades this year. I’m still not convinced that dispositions should be the focus of education. I see it as the undergirding for the learning of content. Response: This makes me think of maturity. As we mature, we understand more of cause & effect and thinking before speaking. Response: empathy is a major part of design thinking, which our school has embraced. creating solutions to problems that have an end user – empathize with the end user. Response: I’m not sold that deeper learners have to have all of these dispositions. I know the authors said that there are journeys for each of the dispositions, but I get the impression that all 16 are supposed to be there in some way shape or form. Authors believe when confronted with problematic situations, these dispositions serve as an internal compass. It might be referred to as inner self-coaching. They argue these dispositions are more important than content knowledge. Response: Why does it have to be one or the other? I have difficulty when people say that content knowledge isn’t as important. This is said by people who have content knowledge. They don’t know what it would be like to go through life without the content knowledge they already have. Plus when we think about scaffolding and building on prior knowledge, one must have content knowledge to actually build on. suggest dispositions become goals of curriculum & teachers deliberately teach & assess them. Response: Again, I’m not against these dispositions & I do agree they should be taught and assessed. I’m glad we will assessing the mindsets specifically. I just don’t think they are primary goals, but secondary goals. Response: When I first came to my current school, this is something that stood out to me. Our school has done an excellent job of this. This entry was posted in Teaching on August 7, 2017 by romathio. I was so eager to read this chapter of our summer+ learning faculty reading from Deeper Learning: Beyond 21st Century Skills. Something that I heard Dylan Wiliam say back at NCTM in April 2017 has stuck with me – “Teachers need a habit change more than they need more knowledge.” How do we move teachers from knowledge to action? I wish this chapter had been required reading for all of our Upper School teachers and not an optional one. Excellent read and glad I chose this chapter. Our education has gotten better than in the past, contrary to reports. More student are taking honors & AP classes. However, a good high school education is only preparing our students to live in the 1960’s! In 1970, 74% of the middle class was made up of HS graduates and dropouts. By 2007, only 31% of the middle class was from these groups. In the same time period, the middle class with postsecondary education went from 26% to 61%. Between 2010-2020, only 7% of jobs will be available for HS graduate and dropouts; those are limited to either low paying or declining in numbers. Postsecondary education & training is no longer just the preferred pathway to the middle class, it is increasingly the only pathway. Response: A bit of a push back here. Why have we allowed good job training in HS to basically go away? Where students could learn how to be a mechanic before they graduated and had a job lined up? I just don’t believe everyone needs to go to college or should go to college. They do need either job training or college though. I’d like to see that job training go back to being part of high school. Response: What makes a PLC “high-performing”? What kind of leadership is needed to make this happen? “an ongoing process in which educators work collaboratively in recurring cycles of collective inquiry and action research to achieve better results for the students they serve” (DuFour, DuFour, Eaker, & Many, 2010, p.11). Response: What if some the educators in the PLC are resistant to change? a. What is it we expect all students to know and be able to do as a result of each essential standard we teach? b. How will we know when each student has learned? Response: This is SO key! Formative assessment is to inform us, the educators, about next steps. It doesn’t happen enough. c. How will we respond when, at the end of a unit, some students have not learned? Response: Great question. I find this difficult in math because of the time pressure to keep moving on. How can I circle back with those students who are struggling? Or, will our newer method of lagging assessment help in this area so that all students have the time needed to master concepts? Response: Another difficult one for me. In the past, I had students complain that they had more work. Obviously I didn’t pick the right extensions or way to offer those extensions to the students. I need to work on this. 2. Collaborative teams of educators need to work interdependently to achieve shared goals for which members are mutually accountable. Response: What if the goals aren’t shared? I’m assuming the goals are that of the particular school or school system. This can be tricky in the hiring process. Some people are good in interviews but not so great as employees. Other times you are desperate for a teacher in a high need discipline and don’t have a lot of options. 3. Educators use evidence of student learning to inform and improve their professional practice & to better meet the needs of individual students. DOK 4 – Extended analysis or investigation that requires synthesis and analysis across multiple contexts and non-routine applications. Response: This is HUGE! Lots of students pass math classes but struggle with these higher levels of DOK. I go back and forth on this. In one sense, I believe all students can learn math at higher levels & I want them to. However, I also think students who pass with a basic understanding still passed and not sure that means they should be considered deficient on a standardized test. As a private school teacher, I didn’t know this because our students don’t take these tests. They are organized by grade level or content. Response: I love my school. I wish we had content leads and more work in HS organized around content. I do interdisciplinary work as well & will continue to do so, but I have to know the math content and how to be a good math instructor. I hope our school will organize PLCs around content in the HS (or around groups like STEM/STEAM & Humanities). 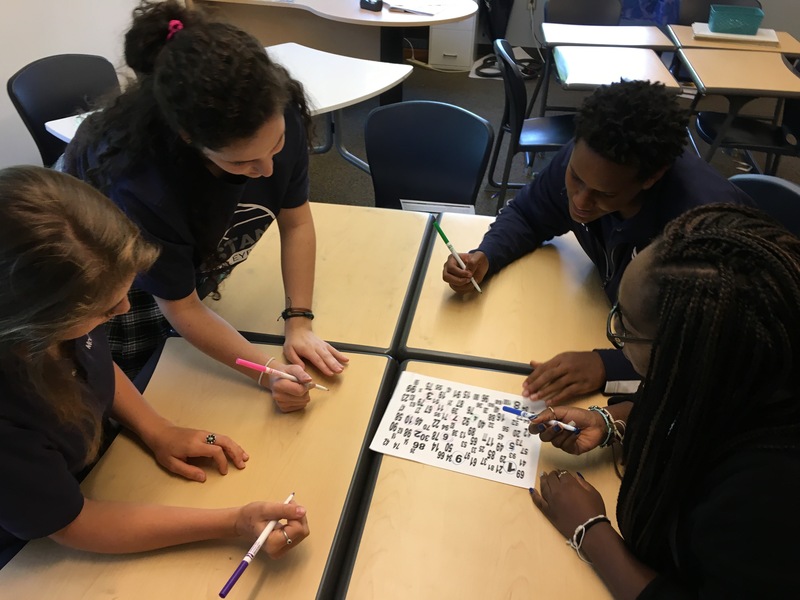 The deeper learning of the CCSS certainly lends itself to interdisciplinary efforts that cut across subject areas, but we recommend that these efforts come later in the process. In the initial stages of teaching and assessing for deeper learning, job-alike teams represent the best structure for collective inquiry. Response: YES! This is what I just said above. I think in our quest to go interdisciplinary, we didn’t make sure that teachers were solid in their own content and pedagogy first. Too many things at once overwhelm people. Collective inquiry starts with why before the how. If Ss are to learn at deeper levels, schools must create the conditions that allow for the ongoing, deeper learning of the educators who serve those students in each of the three critical areas (1) curriculum, (2) pedagogy, and (3) authentic assessment. Response: YES to both of these!! Something I struggle with – it seems as if people think everyone in the room has an opinion of equal weight. I don’t get this. If I were a novice to something, say programming on a computer, and I were in a room of experienced programmers, I don’t think my voice/opinion should carry the same weight. In teaching, I haven’t seen it work that way. I’ve watched our teams make poor educational decisions because the “majority” were people who don’t have the same understanding of curriculum, pedagogy, and assessment as more experienced & more educated teachers. This is nonsense to me. Edited to add: I think the top thing our school needs to do to help in these 3 critical areas is to address the faculty turnover rate. Our turnover rate is high and we don’t do exit interviews. I understand exit interviews are like summative assessments, they are post-mortems, but I think they still need to be done. More importantly, some type of “formative assessments” should be done by admin/leadership to determine where teachers are throughout the year. This has to be done in a way where the faculty don’t fear for their jobs by being honest. IMO, this is the #1 priority our school needs to work on. The work we do yearly on hiring & then training new faculty is exhausting, time consuming, and drains resources. Challenge – how to best ensure that each teacher is clear about and committed to teaching the essential standards. Response: what if there isn’t agreement? Response: Again, what if teachers make this commitment to the team and then still do it different in their classroom because they didn’t agree on the priorities? When done well, a team will regard the essential skills of a guaranteed curriculum…as a promise they are making to students and to one another about what each student will learn. Response: Pet peeve of mine, which relates to something I mentioned under pedagogy, why don’t schools of education focus more on teaching about how to do assessment?! In my 2 year MA in Education program – not one class on assessment. In my 2 year Ed.S program – 1 class on assessment. It’s a topic I love, so I’ve read a lot of research, etc. However, most teachers have had little to know learning on this topic. They just assess the same way they were assessed. They recommend looking at PARCC and Smarter Balanced tests to get an idea of how students will be formally assessed. Since I’m at a private school our students don’t do this. I do think it is important to take a look at SAT & ACT exams since most students still need to take one of them for college admission. Response: what if only 1 teacher instructs a certain course? how to get the team together to write these common assessments? what if not all team members see this as necessary? Response: Amen & amen to this whole bit about supporting students. This reminds me of the recommendations in NCTM Principles to Action for additional support for students who need additional time/help. It is the school’s responsibility to help students in these areas. If we accept a student in our private school, we are saying they can be successful. Response: In our school – how do we get this to happen? How do teachers develop the assessment literacy that can serve as a catalyst for improved pedagogical practice? Again, work as collaborative teams to build common assessments instead of working as individuals. This entry was posted in Research, Teaching and tagged deeper learning, professional development on August 7, 2017 by romathio. Our faculty is reading 4 chapters of Deeper Learning: Beyond 21st Century Skills for part of our summer+ learning. This is part 2 of my notes. “Researchers are not only identifying new ways of learning; they are also pinpointing the best practices in instruction, curriculum, assessment, and leadership that show the highest promise for transforming learning from the superficial recall and regurgitation of facts, figures, and procedures to the intentional development of crucial cognitive skills (News from the National Academies, 2012)” (p. 3). My response: When will admin & teacher actions match what we know from research? I tend to think too many teachers have more autonomy than they are actually ready for as they are still novices. My response: Several of these are also MV Mindsets. I believe our school is on the right track. Teachers with a deeper learning agenda do more than ask students to memorize facts and procedures, practice skills for rote recall over and over on worksheets, and fill in the blanks on quizzes and tests (p.7). Deeper learning is a process that enables students to become more proficient at developing the fullest possible insights into the meaning of curricular content relevant to college and careers in this century (p. 8). Deeper learning is an outcome that results from the self-directed transfer of the 4Cs to the student’s understanding of a concept’s meaning (p.9). My response: I notice that my main areas of interest are really around changing teacher beliefs & actions to best help students. 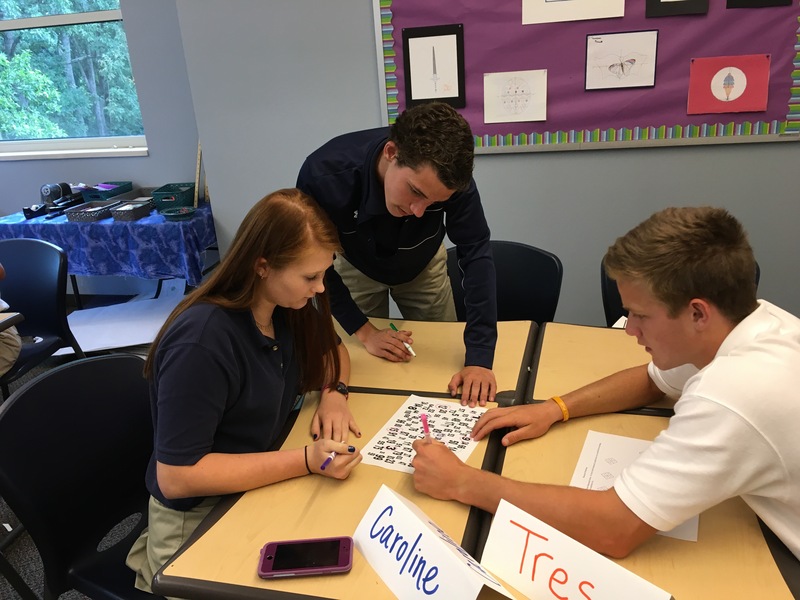 This entry was posted in Teaching and tagged deeper learning on August 6, 2017 by romathio. Looking for the DEEP DT Playbook? Go here. Excel Spreadsheet that can help with Project Design. Here is a 5 minute video with some reflections from students at the end of the Bike Project in 2016. 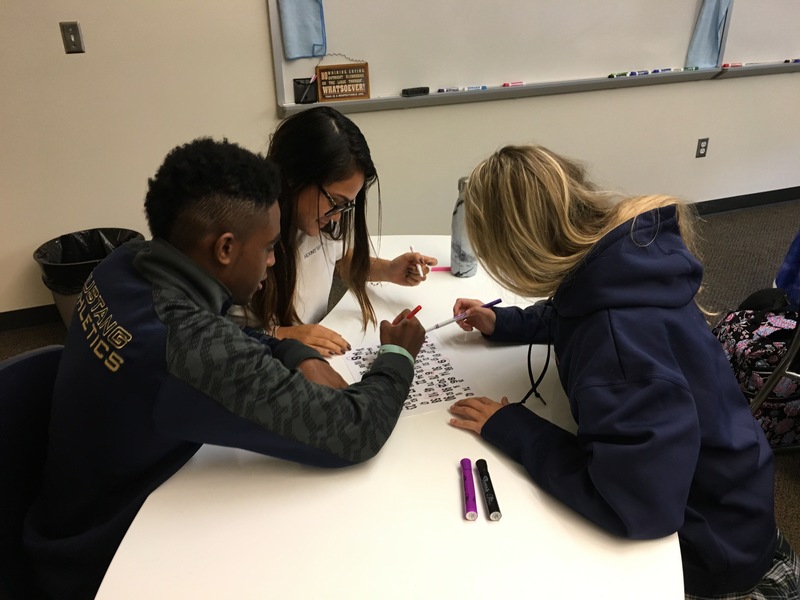 This entry was posted in Design Thinking, PBL, STEM, Teaching on April 5, 2017 by romathio.